Xiao Xiang Yeyu (Night Rain over the Xiao and Xiang Rivers), acquired by 沈興順 Benny Shum Hing Shun in 1995, was loaned to me for the recording of Music Beyond Sound. The qin had been repaired shortly before the recording. According to Mr. Shum, the shape and seeming age of the wood imply Song dynasty construction, although it is quite round on top, typical of the Tang dynasty (618-907). 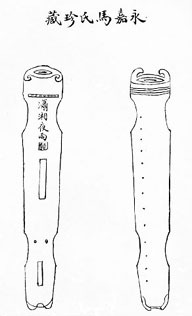 Although typical Song dynasty instruments tend to be flatter, there were also many made in Tang style. The Ming dynasty repair assumption is due to the lacquer being mixed with powdered cement, rather than powdered deer horn -- this latter typical of the Ming dynasty. "This old guqin is a treasured heirloom. As for its value, it must be worth more that 500RMB, (but) it is not for sale and my descendents should not regard it lightly. They should forever (keep it as a) valued treasure. The 94 year old senior citizen Elderly Ju wrote this in the Cottage of Harmony." Xiao Xiang Ye Yu is also the name of one of the 8 Views of Xiao and Xiang as well as of a qin melody. 1. I cannot find the original Chinese for the inscription.